Velo Orange is working on a new bike design that should be a big hit. 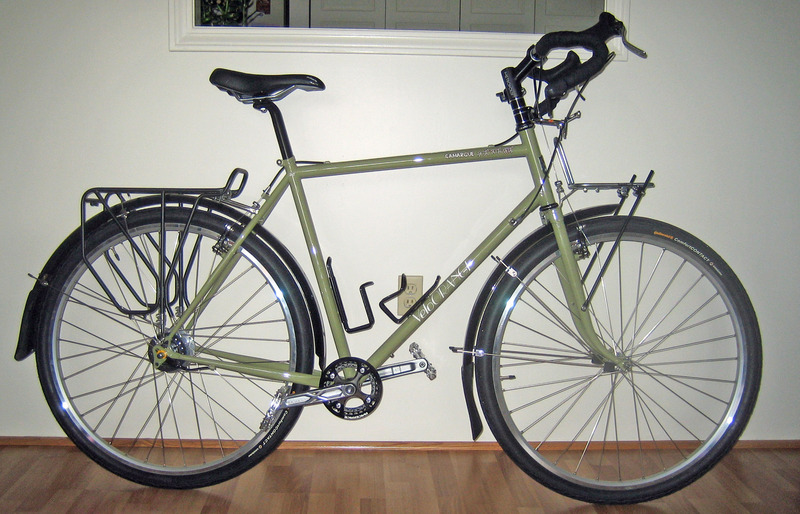 Their “Camargue” frame is a traditional steel touring frame modified to accept up to 2.3 x 29 inch tires on 700c wheels. It is exactly what I’ve been looking for to pedal the long unpaved rail trails in New Hampshire, Maine, and along the Erie Canal in upstate New York. The pea green paint is pretty bland, and their orange sample is worse. Here’s hoping they get bold with something in an elegant steel blue or deep carmine. The green might not be as insipid if outfitted entirely with black components. I’ll be first in line for a 62cm frame, in any color. Unlike most newer frames, this one has horizontal rear drop-outs, so it can take an internally geared hub without a tensioner. Chris Kulczycki, the boss at VO, built his personal bike with an Alfine 8-speed hub. I hope my suggestion led him to try it. I was planning to sell my Soma Junebug bar, but will keep it now to use on this bike. I also have another Wippermann Connex chain and a new Race Face Evolve crankset on hand. I’ll use the new VO Zeste cantilever brakes that I bought for my Cross-check on this bike. I’ll build new wheels, using VO’s promised wide 700c rims, their front hub, and an Alfine 8-speed rear hub with a Jtec bar end shifter. My Surly is loaded with VO components, so I guess it would be okay to put a Surly Nice rear rack on this VO frame. Planet Bike Cascadia 29 fenders will keep the frame from getting blasted with grit. I’ll swap the heavy-duty bottle cages off my Surly. 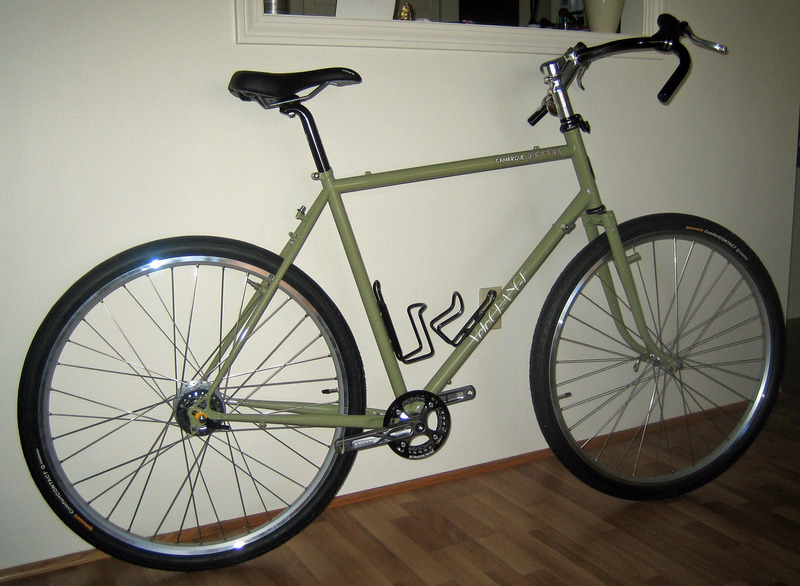 Since this bike will be used almost exclusively off-pavement, I will gear it lower than my Surly. The Race Face crankset has a 32-tooth chainwheel which, with a 20-tooth cog on the Alfine hub, will provide a gear range of 25 to 75 inches. I rarely use a higher gear even on pavement. The frames and wheel rims are promised for mid-winter delivery, along with black headsets and other parts, so this looks like next year’s project. 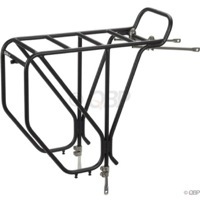 This morning I scored a nearly new black Surly Nice rear rack on eBay for about 2/3 of the list price. 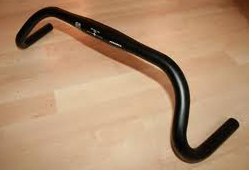 And last week I found a black Soma seat post. Yesterday I swapped saddles on my Surly, so have a nice 175mm gel saddle for the future Camargue. 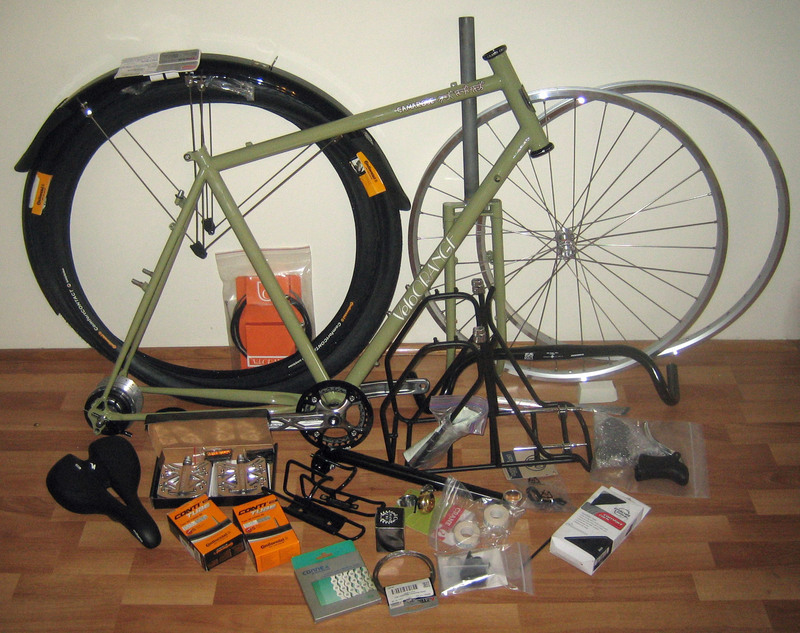 By the time the frame arrives, I expect to have all the components on hand to build the bike I want. 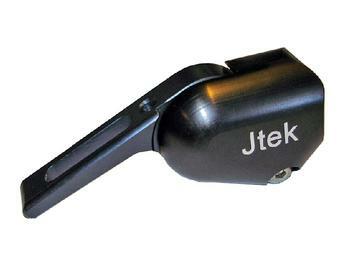 Jtek bar end shifters are temporarily out of stock everywhere, but Ryan Guthrie of Jtek says he should have more available by the end of this month. I also picked up guidebooks to the Erie Canal trail and the other upstate New York canal paths. I’m thinking the best way to go, though, will be a van supported tour with other old timers led by Senior Cycling, Inc. (http://www.seniorcycling.com/tours/#176). Much depends on when the new frame is available. I’m still waiting for the Jtek shifter, and VO now says the Camargue frames will not be ready until Spring, so I guess this won’t be a winter project after all. If VO’s new rims arrive sooner, I will at least build up wheels. In the meantime, I’ve decided not to do the senior tour of the Erie Canal this year, but will continue riding rail trails closer to home. Back in March I wrote that I was selling my house and downsizing my life, and therefore would be cancelling this bike project. Well, I sold the house but have not found a new place yet, so am staying with a daughter in the Boston area. From her condo overlooking the Mystic River, I can bike about 25 miles on paths and trails without having to pedal on any roads other than crossings. Much of that trail network is unpaved, though, and would be perfect for a bike like the Camargue. Fortunately, I didn’t sell any of the components I had collected for the new bike. Most of my belongings are stored in a mover’s warehouse, but I kept my bike tools and parts out – including my wheel building jig. I picked up a new 36-hole Alfine 8-speed hub on eBay a day before I moved, so I’ll be ready to build the wheels as soon as the rims arrive. VO announced the arrival of their new 28mm Escapade rims today, so I immediately ordered a pair, along with another of their wonderfully smooth low-flange front hubs. This hub is only available with 32 hole drilling, but the rims are available with either 32 or 36. I will use 32 on front and 36 in the rear, the same as on my Surly. Now I just need to find my stash of spokes in the self-storage unit. The new rims and hub arrived this week, I found the stored spokes, and ordered more for the rear wheel, so will get started building wheels. Velo Orange is a real class act. Their hubs are polished like jewels, and come packed in velvet ditty bags. 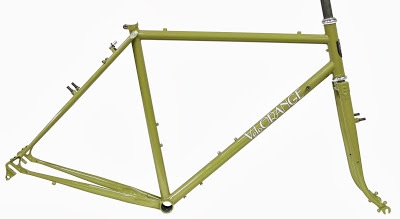 VO now has the Camargue frames in stock ready for shipping. I’ll be ordering a 62-cm tomorrow, with headset installed and a set of their big Sabot platform pedals. A big box of components arrived Friday from Universal Cycles. Tires, tubes, spokes, brake cable hanger, bar tape, and wide plastic fenders. 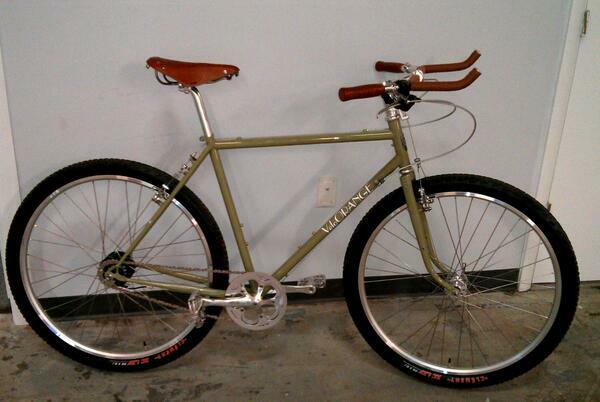 VO sells beautiful metal fenders – I have a set on my Surly. They are strong and long-lasting. They also rattle, dent, and reflect sun in my eyes. So for the Camargue I bought a set of 65mm wide Cascadia MTB fenders. They are made of strong flexible black plastic that doesn’t dent or reflect light. The Cascadia fenders also have breakaway struts that give way if debris gets caught between the fender and front wheel, so the rider doesn’t get thrown. The new frame should arrive soon. I asked VO to delay shipping, as I was out of town most of last week and will be for the next few days. The whole build may be delayed too. I am in the process of buying a condo, and just started a new project for the Virgin Islands Port Authority, so am pretty busy for an old retired guy. July 17, 2014 – The Horse is Here! The Camargue frame arrived today and it is stunning. Nicely designed and beautifully finished. I may even learn to like the sappy green color. Maybe after it gets beat up a bit I’ll do a camo job on it. 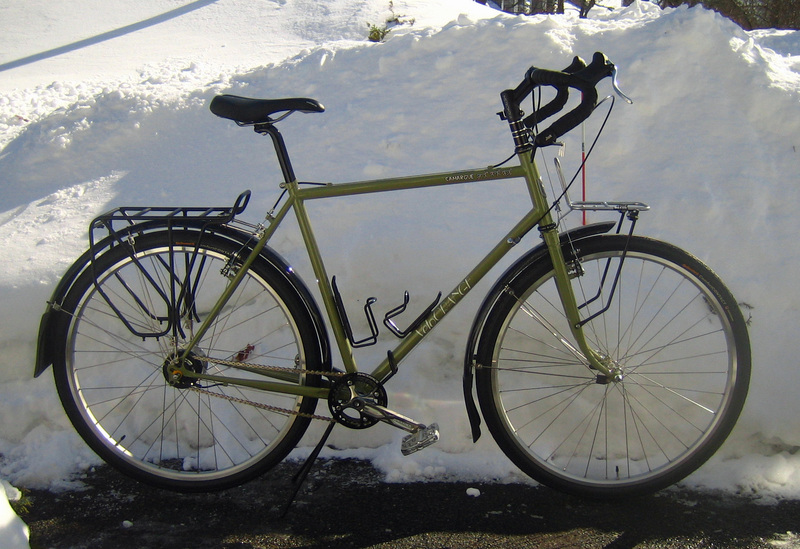 Unfortunately, some key components – crankset, brakes, handlebars, and stem – are in a storage locker 60 miles away. I’ll bring them back next week and ask a local shop to install the crankset. In the meantime, I’ll get cracking on the wheels. The steerer tube looks too long, but it’s only an inch longer than the tube on my Surly, and that’s a good thing. I won’t cut it until I’ve ridden this bike for a while, even if it means stacking spacers above the stem. After dinner tonight I sat down and laced the front wheel together. 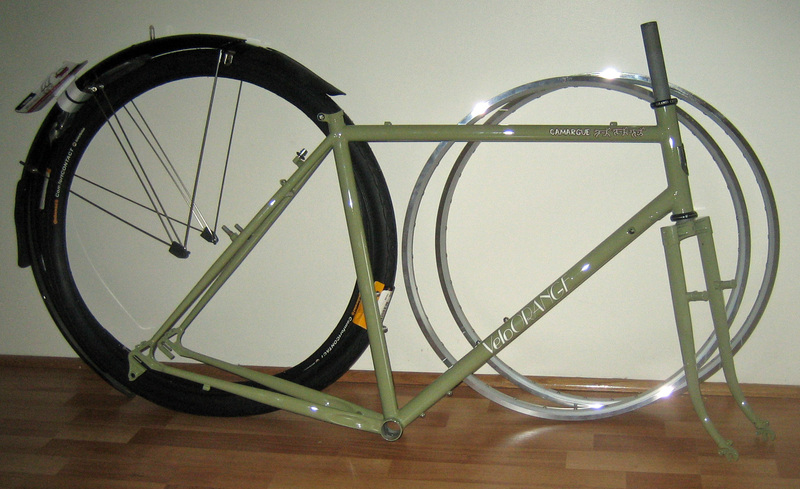 I started to build this wheel last month, but found the 303mm spokes that I had used on my other bikes were too long. It seems the VO Escapade rims are quite a bit deeper than the Sun rims. 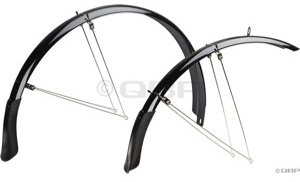 If you are planning to build a wheel using the VO low-flange front hub and 32-hole Escapade rim, with a traditional cross-three pattern, the correct spoke length is 296mm. Tomorrow I’ll dig out my trusty old truing stand and finish this wheel. I’ll hold off on the rear wheel until after I have a shop install the crank set, so I can mount the hub in frame for the tech to get the chain alignment. My Camargue frame is in the bike shop for installation of the Raceface crankset, since I don’t have the tools or experience to install that type of bottom bracket. Because it is midsummer, the shop is running a week behind. They have promised it by the 6th. And I cannot find my wheel truing stand anywhere. I’m certain I had it with me when I moved to my temporary home between homes, but it’s not here or in either of my self-storage areas. It will surely appear as soon as I buy a new one. Still hoping to get this bike out on the trail before summer is over. When I was a kid, my favorite toy was my Erector set. I still like bolting stuff together (and still have the Erector set). Waiting now for the wheel truing stand and starnut tool, along with some bits and pieces, to arrive from Universal Cycles. Looks like a fun weekend project ahead. JHA Cycles installed the crankset, but got the chainline about 7mm off. Reversing the hub sprocket picked up about 2/3 of that; someday I’ll switch the spacers on the bottom bracket to correct the other couple of millimeters. Today I spent about an hour trying to get the snap ring back on the hub after reversing the sprocket, then realized I need to remove the sprocket to lace the wheel together. I’m beginning to like the color of this frame, despite my earlier protestations. It’s not olive or pea green as it appears in some of the photos, but a soft warm moss green. I expected the color would work well with black components, but have been surprised at just how good the combination is. When I mounted the front wheel in the fork this afternoon, I was dismayed to find the distance between the rim and the brake boss was 1/4″ more on one side than the other. I reversed the wheel and the gap remained on the same side, so I knew the wheel was not the problem. Although the dropout spacing is correct, it’s evident that the fork blades are attached to the crown at different angles. VO has promised to ship out a replacement Monday morning. The Camargue frame is designed for front-loaded bags. 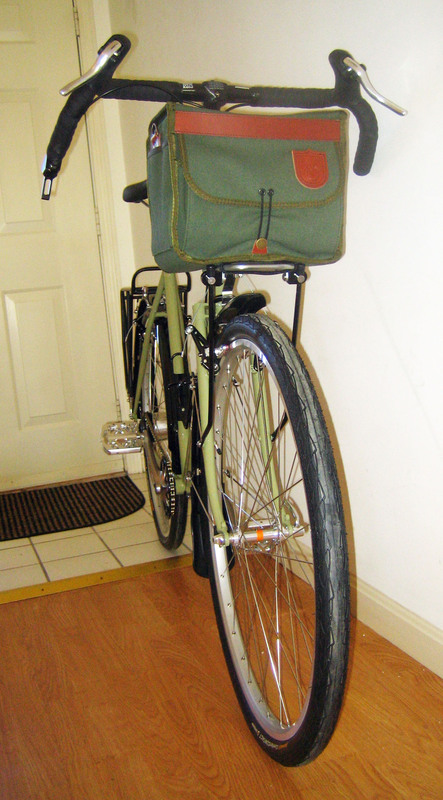 In the 1970’s I had a French TA handlebar bag, but have since been using rear rack bags. 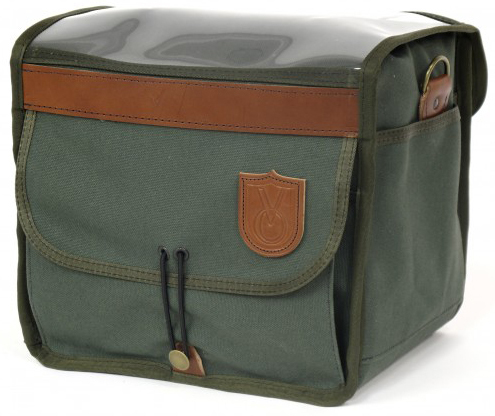 VO now offers a bag similar to the TA, but bigger, more rugged, and beautifully sewn in the U.S. I justified the $200 price tag because I sold my TA bag on eBay for $229. 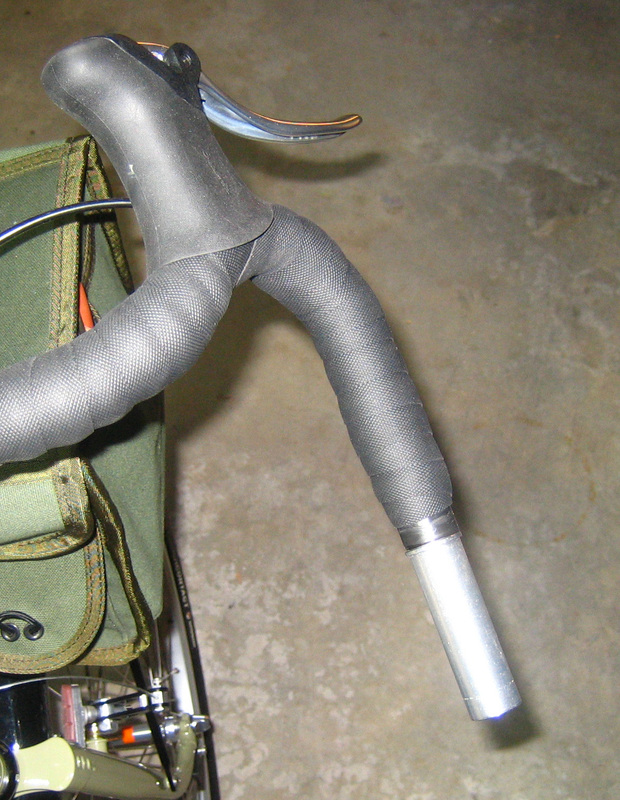 Large handlebar bags like this one need support. I don’t want to use a full front rack that bolts to the dropouts because it would stiffen a part of the fork that absorbs road shock. 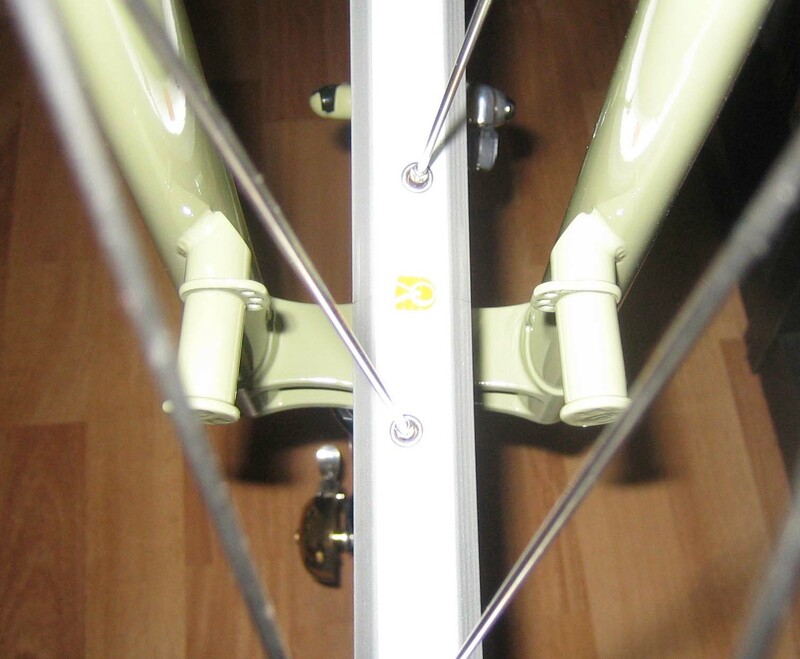 And a mini rack that bolts to the brake bosses won’t fit the Camargue because of the extra tire clearance. 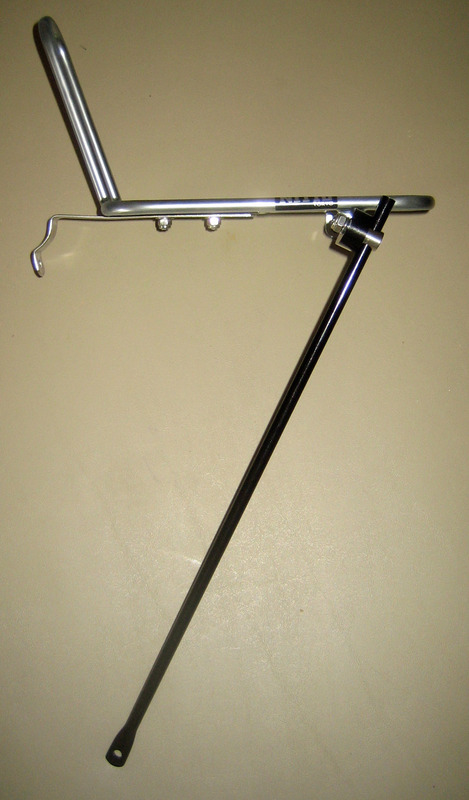 My solution is to use a Nitto M18 stainless steel rack, which normally attaches to the fork with P-clamps. Unfortunately, the Nitto rack is not available in black, but it will be largely hidden under the bag. Instead of the P-clamps, I’m using Salsa rack struts that will bolt to the mid-fork bosses. 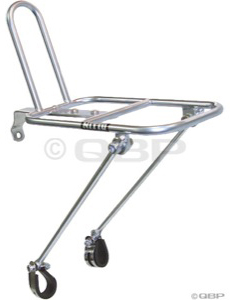 The Salsa struts bolt directly to the Nitto rack with Salsa clamps. I’ll trim them to size after mounting the rack on the fork. 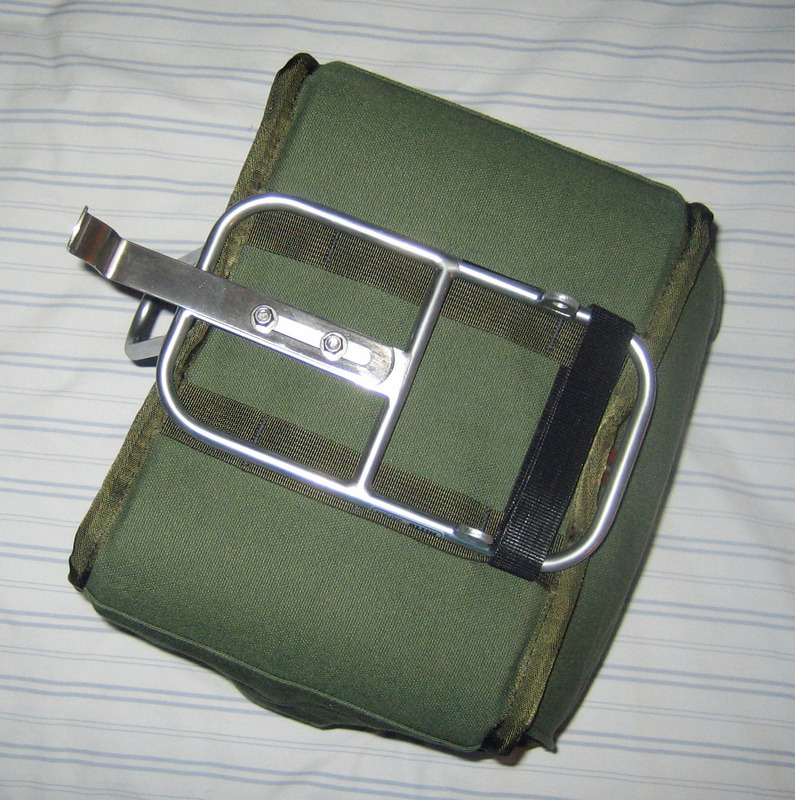 The Nitto rack is the same length as the depth of the VO bag, and fits the reinforcing webbing. A black Velcro strap keeps the bag from bouncing or shifting from side to side. The VO bag comes with a plastic stiffener that must be inserted between the inner and outer canvas panels. At first this seemed like an impossible task, but I finally managed to do it. The trick is to press it in on one side until it bumps against the corner. Then reach in on the outside of the stiffener and ease it around the bend. Then keep pressing until it hits the other bend. At this point, reach into the other side pocket and pull the stiffener around the second bend. Then push and pull it until it is in place. Finally, tuck the ends into the folded over inner canvas panels. For those not familiar with WordPress blogs, note that you can enlarge any photo to full size by left-clicking on it. The Camargue is beginning to look like a real bike. The replacement fork, along with a black stem and spacers, were all shipped out yesterday. Shortly after my last post in August, I bought a condo that needed a complete cosmetic rehab after twenty years of scant maintenance. Between moving; painting; replacing carpeting, appliances, and fixtures; and working on the Virgin Island project; all the fun stuff – including finishing this bike – got set aside. Here’s what it looks like now. All it needs is a shifter cable and chain. I’ll adjust and trim the fender supports, and shorten the front rack supports. I plan to ask Sam at Corner Cycles to take 20mm off the steerer tube and adjust the bottom bracket for better chain alignment. The seat is set at about 103% of leg length from the pedals. The top of the bar is about three inches higher than the seat. That is the proper setting for the Soma Junebug bar, which is designed for use on dirt bikes. I plan to lower it about 20mm, though, as that seems to be a more comfortable setting for me. Yesterday, when I returned from what is likely to be my last ride of 2014, I found a package in my mailbox from Ryan Guthrie of Jtek Engineering. In it was a new bar end shifter that had been back-ordered since early September. The new shifter replaces a defective one I bought from Ryan a year ago. When I tried to thread the cable through the old one, I found the parts were misaligned and the cable hole was partially blocked. It was also finished with a powdery flat black paint that easily rubbed off. Ryan explained that he outsourced production of the shifters after his CNC machine broke down, but that the quality of the contracted work was not acceptable. The new unit appears to be up to the standard of the original one I have on my Surly, though. I highly recommend these shifters for an internal hub bike with drop bars. I’m also very pleased with Ryan’s response to this final glitch in a project that took much too long to finish. Be careful if you find a used one, though. If it has a shiny finish and white lettering it’s okay. Don’t buy one with flat paint, though, as it is probably one of the bad batch. 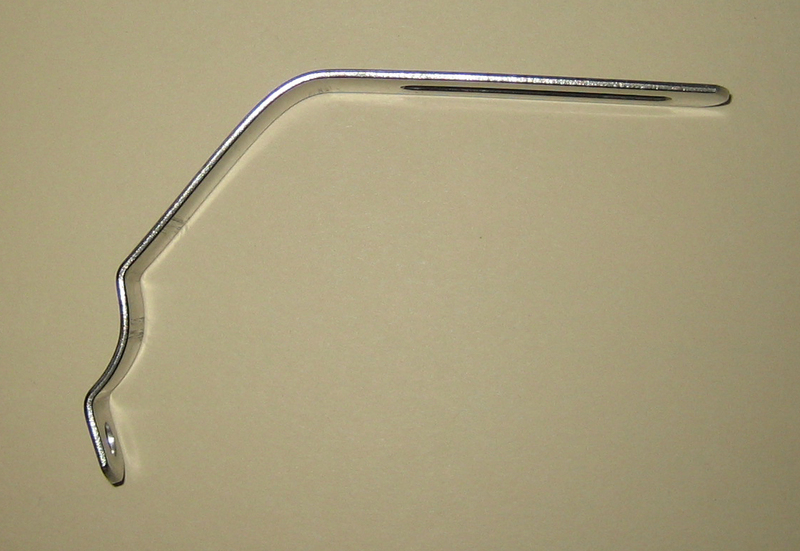 While waiting for Jtek to resolve its production problems with its bar-end shifter, I looked again at alternatives. The Versa brifter, once the only other way to shift an internal hub with drop bars, is apparently no longer available. Shimano now offers a nifty electronic system with a radio transmitter in a brifter that sends a signal to an electric motor on the hub and to a digital readout on the bar. Pretty neat if money is no object, as the three components cost about $500. More digging through on-line blogs led me to a neat little item sold by Hubbub. It’s a 22mm diameter extension that attaches to the end of a 24mm bar with an expansion plug like those on most bar end shifters. It’s $60 price is outrageous, but it’s a well-made piece of gear that does what it claims: allows using a twist shifter on a drop bar. I found a new old stock shifter on eBay for less than $20 including shipping, so the total cost is comparable to the Jtek. The result looks pretty clunky, but would probably work quite well. I also tried it with a Shimano Rapidfire click shifter, and found that would be even clunkier looking but should work too. I’ll be sticking with the Jtek, though. The Camargue is finally ready to ride. Unfortunately Cape Cod still has several feet of snow on the ground and the temperature hasn’t risen above freezing for weeks. The roads are narrow and the paths covered with snow, so it will be a while longer before we get a test run. It did come out pretty nice though. 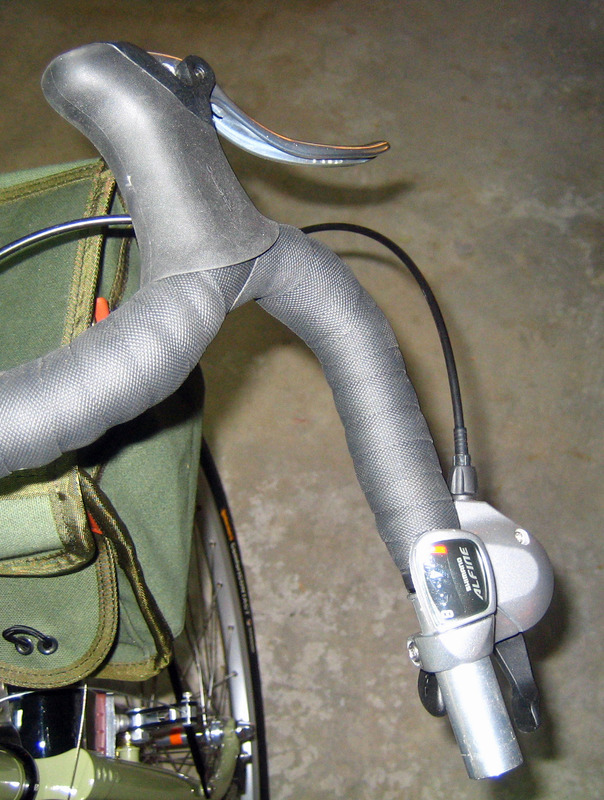 When I hung the VO bag on the decaleur, it sat about 1-1/4″ above the front rack. I could not hang the support any lower on this tall frame. The stainless steel tang that connects the rack to the fork crown is adjustable over a broad range, so I flattened the bend at the fork by crunching it in a machine vise. Then I bent the tang 45 degrees at the height I wanted. This worked perfectly, as you can see in the photo of the finished bike. I also changed the rack supports, replacing the straight supports with bent ones. Either will work; I just like the looks of the bent ones better. Still waiting for a break in the weather. 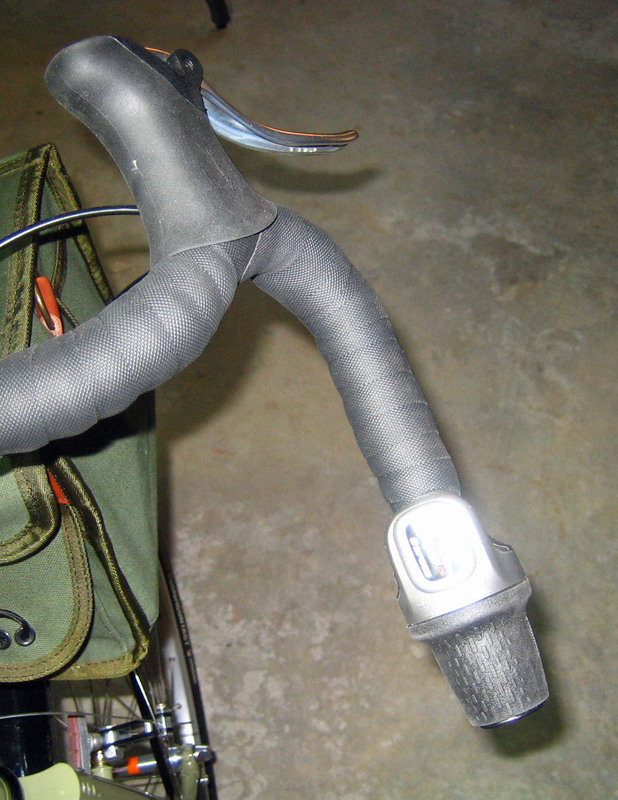 I used a sharp-pointed wood bit to drill holes in the leather back of the handlebar bag to bolt on the decaleur. This week I’ve been looking at trails in the Leesburg Virginia area. My nephew lives there, so I might use his place as a base for some day rides on the Old Dominion Trail and the Chesapeake & Ohio Canal Path. I’m thinking of riding the first 22 miles of the C&O Path out of D.C., and the ten-mile stretch of the O. D. Trail west of Leesburg. The Old Dominion Trail is paved, but the C&O Path is not. But first I need to get back in shape, as I’ve only been on a bike once since last August. I read some disturbing news in the latest issue of Adventure Cyclist. In an article on drivetrains for touring bikes, Dan D’Ambrosio reported that Shimano voids the warranty on its Alfine hubs if the chainwheel to hub sprocket ratio is less than 2.3:1. Both of my other bikes run 2:1 ratios, and the Camargue is a very low 1.6:1. Since I only ride rail trails and canal paths, which tend to be pretty flat, and at age 74 I won’t be cresting mountain passes with 80 pounds of gear, I don’t expect any problems. But I will certainly be aware of the apparently inherent weakness of these hubs from now on. I took this bike out for a quick test ride around the neighborhood Saturday, but didn’t get far as the Alfine hub kept skipping. I suspect – and hope – that it’s just a cable adjustment. I didn’t have time to fix it over the weekend but will take a look at it tonight. Finally took this bike out for a shakedown ride today – seven miles on the Shining Sea Path between West and North Falmouth. I would have ridden farther but was uncomfortably overdressed and forgot my knee brace. After about a mile the seat self-adjusted, but everything else worked well. The transmission problem was due to a maladjusted cable – it worked fine today. I adjusted the seat and tweaked the bar angle when I returned. I am delighted with this bike. It is lively and comfortable; and handling is intuitive and predictable. The 47 mm, 50 psi tires absorb bumps with no discernible rolling resistance. And I like the VO pedals with their ultra-smooth bearings and big platforms that work great with any shoes. Gearing is low for paved trails – I ran mostly in 7th and 8th gear today – but that is as intended. It should be perfect on unpaved trails. The low trail fork will also be better on dirt, although not bad on pavement. 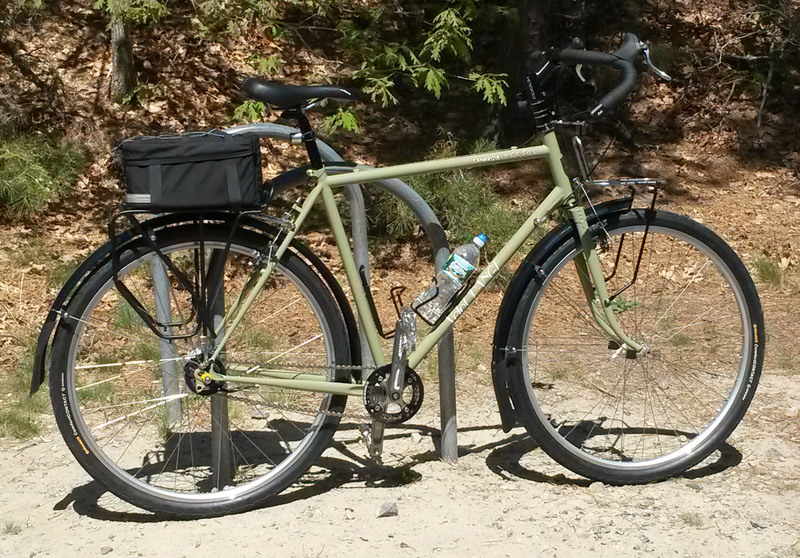 This is a big heavy (30 pound) bike, but it rolls with very little effort, like my Surly. It’s not made for speed, but I think I could cruise along all day once I get back into shape after this brutal winter. And I have to sheepishly admit I’ve grown fond of the moss green paint. The VO Gran Cru Sabot pedals were a terrific choice. The big platforms support any type of shoe and the replaceable cleats stick to my Birks like glue. No need for toe clips or straps at all. So far I like all the choices of equipment on this bike, with the possible exception of the Soma seat post. It looks great but doesn’t want to hold adjustment. If it continues to self-adjust I’ll replace it with a VO noir. The Soma Junebug bar seemed too wide on my Surly, but feels just right on this big bike. Here it is nearly two years later and this bike has been gathering dust in my basement while my life has moved in another direction. I’m still biking the rail trails but have let go of the plan to bike the long unpaved trails and canal paths. I had great fun building this bike, but it’s time to let it go. I’m tearing it down, salvaging the Alfine hub, VO pedals, and Jtek shifter; and will be selling the frame and other parts on eBay. The pedals have already moved to my Jamis town bike, and I’ll lace the hub into a spare rim for my Surly. Any update? I’m considering one, and I would love to see the final product! Currently on hold. I just bought a condo that has had nothing done to it since it was built 20 years ago, so am painting, renovating, and moving all at once. Nevermind, saw that it is Soma Junebug. I’m hoping to put a Portola on my Trek 520. Looks like a great bar. I have a Portola on my Surly and like it a lot. The Junebug felt too wide on the Surly, but seems just right on the bigger and heavier Camargue. Did you go for 53 or 56 Portola? I’m much shorter than you on a 50cm frame, so would definitely go for the smaller size. I currently have Nitto mustache (RM016?) and I think even they are narrower than the Portola. Also, where did you buy?